Z Hotels has opened its fifth London property, located opposite the Royal Courts of Justice and close to Blackfriars station. Z City currently offers 50 rooms, although this will eventually rise to 109 rooms as more are completed in the coming weeks. The hotel is housed within a converted office building on Fleet Street, close to the established Apex Temple Court hotel. Room choices include Z Double, Queen, Accessible and Inside (ie: without windows) rooms, with rates starting from £60 per night, and features include 48-inch LED TVs with complimentary Sky Sports and Sky Movies, free wifi, hand-crafted beds and power showers. Z City also features the group’s largest café to date, which serves complimentary cheese and wine between 1700 and 1900 each evening. 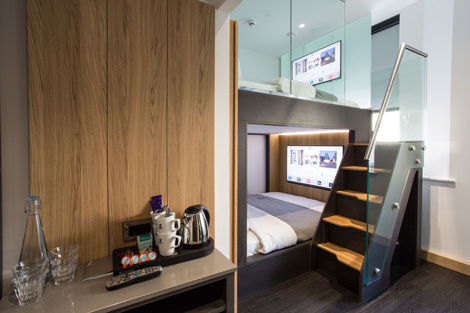 Z Hotels – which describes its offering as “urban luxury at an affordable price”, now officially has seven properties in its portfolio – five in London (Soho, Victoria, Piccadilly, Shoreditch and City), and one each in Liverpool and Glasgow. The group has also entered the soft launch phase of its Z at Gloucester Place property, which is spread across buildings at 23, 33 and 51-55 Gloucester Place. When completed later this year the four properties will operate as one 89-room hotel, with the largest building featuring the hotel’s seating and reception area. In addition Z Hotels is also developing a “unique luxury product” at 87 Gloucester Place, with 20 rooms offering 24-hour service, “top quality amenities” and complimentary drinks and breakfast. 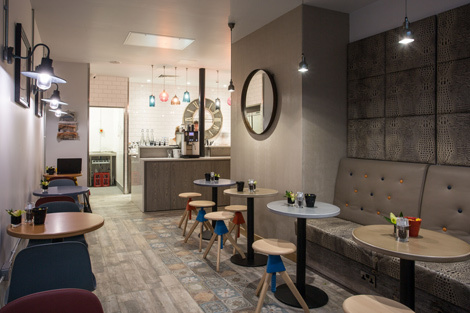 Business Traveller has reviewed the Z Hotels at Victoria and Shoreditch – to read these please click on the links below.